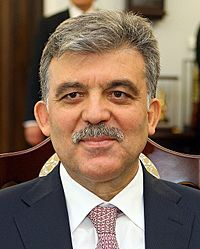 Abdullah Gül (born 29 October 1950) is the former President of Turkey. He served from 2007 to 2014. He was Prime Minister from 2002 to 2003, and as Minister of Foreign Affairs from 2003 to 2007. Gül was born on 29 October 1950 in Kayseri, Turkey. He studied at Istanbul University and at the University of Exeter. Gül has been married to Hayrünnisa Gül since 1980. They had three children. Gül with U.S. President Barack Obama on Obama's first visit to Ankara, 6 April 2009. Gül awarded "Statesman of the Year" by Queen Elizabeth II, 2010. Abdullah Gül Facts for Kids. Kiddle Encyclopedia.